"The 1760s were a time of reorientation for opera – more musical drama rather than a loose succession of brilliant circus numbers for the singers was the aesthetic goal of many composers, among them Christoph Willibald Gluck. The Neapolitan Gian Francesco de Majo (1732-1770) adopted the reform approach and had the good fortune to work in Mannheim from 1764-1766 with the best orchestra of that day. 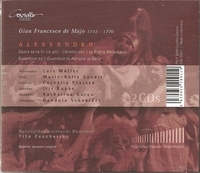 His opera ALESSANDRO was premiered in Mannheim in 1766. Based on a traditional story about Alexander the Great, Majo's musical setting is far from conventional, however. The close interlocking of dramaturgical elements and sophisticated treatment of the orchestra create a new tonal idiom, without forcing the ensemble of singers to forego bravura arias. The Mannheim National Theatre has made this treasure available to audiences again in a production of the highest artistic standard."